Don’t get too close to an elephant when it’s trying to cool off. That was the lesson for one tourist as she tried to bathe the giant mammal while holidaying in Thailand. 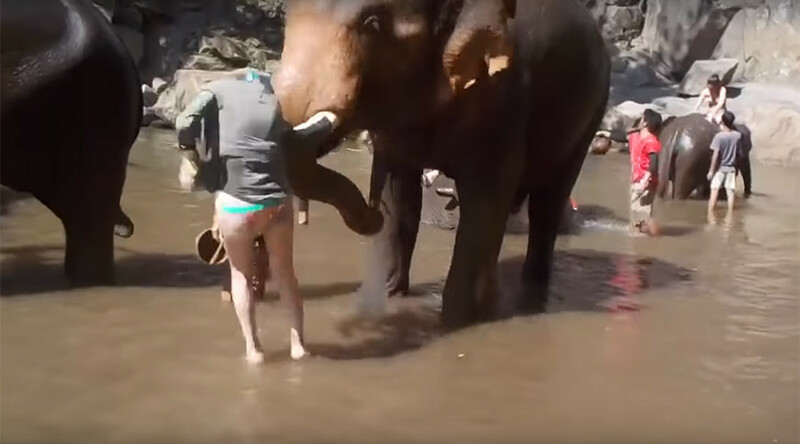 The woman was attempting to wash the tusked beast’s trunk at an unidentified elephant sanctuary but the animal was obviously not too impressed with the meddling sightseer, instead launching her through the air with one mighty push of its massive head. The unappreciated tourist was luckily left unhurt, crashing onto the ground mere feet from a number of sharp rocks. “I was also planning on getting an elephant bamboo tattoo while I was in Thailand, which I definitely didn't do after this experience,” she said. “I went from loving elephants, to now being terrified of them."